Change of Plans! I am not completely abandoning the idea of turning the story I have been working on into a book but I have done some serious re-evaluating lately and I have decided to change my focus. The simple fact is that I’m inexperienced as a writer and don’t have any platform so I really want to try to start getting smaller things published and entering contests. A full blown novel as my first project is just proving to be really hard and a little overwhelming. And there are so many great writers websites that I thought it would be kind of fun to just work on smaller things and work on honing my basic skills before attempting something as big as self publishing a novel. I am back from a 270 mile bike ride along the gorgeous Pacific Coast in Southern California. I have grown physically, spiritually, and much deeper in my friendships. I wasn’t able to blog during my trip because my phone died and now I have so much I would love to post about….so much that I don’t have any idea on where to start. I had a very clear picture of what I thought a desert was. I knew all about it from books. I knew there was sand and nothing else as far as you could see. Deserts are desolate empty dangerous places that the sun shines down hard on. As I was leaving Vegas, I was pretty excited about seeing a desert in real life but after being stuck in the traffic between Los Vegas and Los Angelos for about an hour, I decided deserts were not my favorite places in the world –too many cars. There were a lot of plants so you didn’t get the glistening stretch of sand like I had imagined but most of them were very grey and I felt like I was in the bottom of the ocean because the cactus looked kind of like sea weed. Sea weed that was paralyzed in the air..twisted into odd shapes as if they were in lots of pain. No pictures, sorry. Alright, you get the idea. The desert was a little monotonous and a tiny bit creepy with the sea weed cactus. So you can imagine my feelings when we drove into the lush hills of Southern California. Rolling green waves of paradise. My first impulse was to gasp at joy when I saw the deep green shrouded in “mist.” I was quickly informed that cloud like substance was actually “smog.” Hehe, Minnesota girl here. I still thought/think it’s beautiful. And there were a bunch of purple flowered trees in bloom. Purple carpet lay across the park that we ate dinner in and layered on the trees above us. California. Beauty. So much beauty. So that was my first impressions of Southern California:) Anyone else been to southern CA? What were your impressions? And drives light into my eyes. 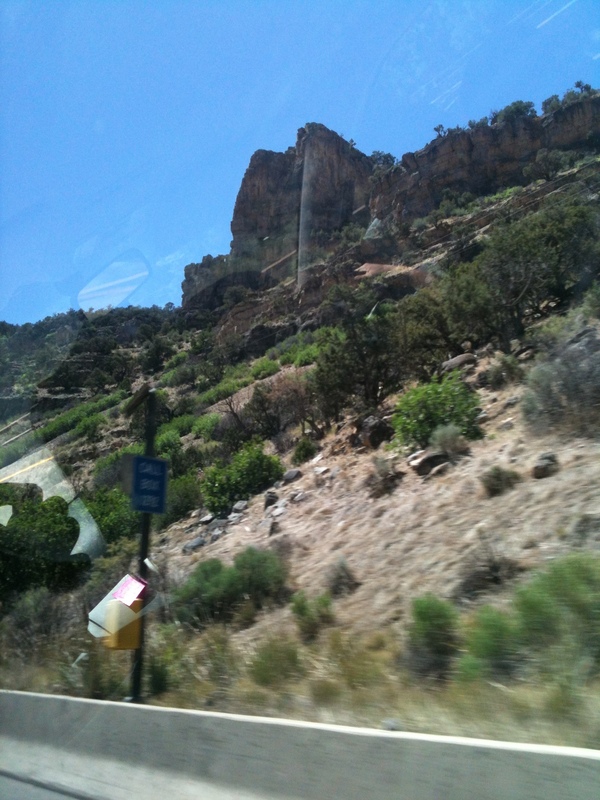 Yesterday we drove through the Rocky Mountains and the incredible hills and plains of Utah. After only 3 hours of sleep, I desperately needed a nap but sleep was hardly possible! I didn’t want to close my eyes for second and miss part of the beauty rushing by the window or the incredible conversations I was having with the other 3 girls in the car:) I tried to take pictures but there is so much more in every moment then a single frame and eventually I just stopped trying and savored the moments. It can be painfully beautiful, literally. So drink lots of water and chew gum to stop ears popping. Also, stop by the town of Empire’s ice cream shop and get a small thick shake because they are huge and the start the trip off the right way. I also realized that it is tricky to blog while traveling–no service on my phone for half the time and we just want to be in the moment but I hope you enjoy the pictures! I hope to speak to you soon about California. 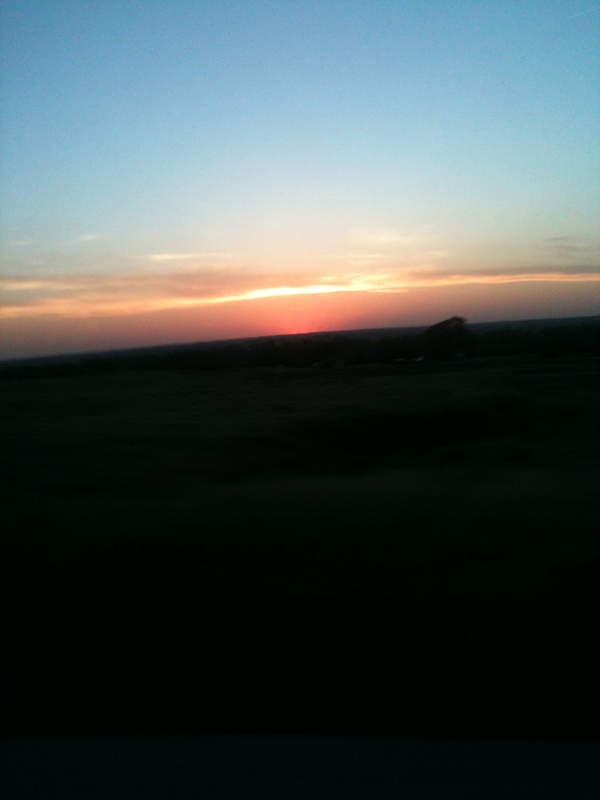 Praise God for all His beauty!! Ok, you know that phrase, “Write what you know about” ? Because I always figured, why write what you know about? That’s boring. The reason you write is to explore. But really, you have to know something about what you are writing about…for obvious reasons. And biking, I have realized that there is a lot I didn’t know about biking. I couldn’t have written about a serious biker before now and sound remotely realistic. Anyways, back to biking which has been my life lately. I wish to tell you about a few things that I didn’t know about biking that I do know now. 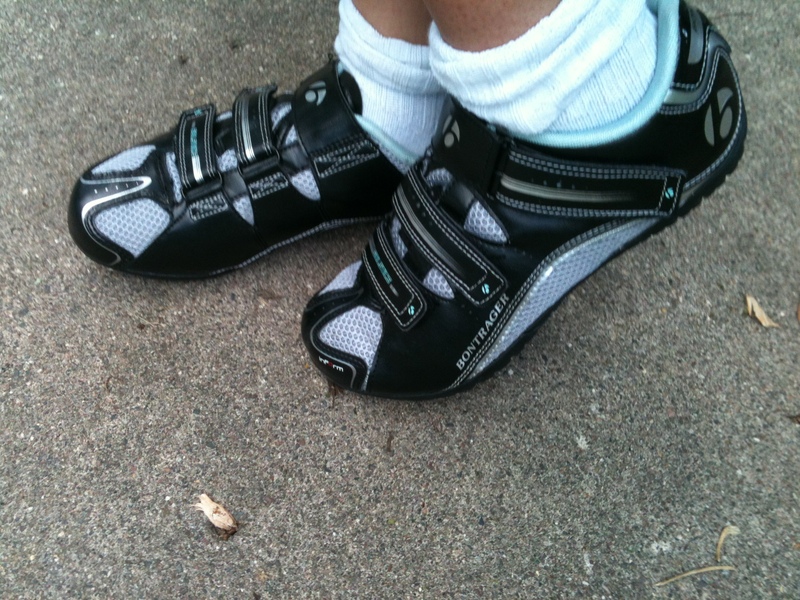 – Did you know that bikers can have clip in shoes so they are basically stuck to their bike? It gives the biker more power apparently:) I had never tried using these shoes but contrary to my former beliefs, they aren’t actually scary. I can clip out easily and it does allow you to bike in a new way. –Did you know that my back get’s more sore then my legs when I bike? I seriously lack any muscle in my core area (and that is really going to bite me eventually if I don’t do something about it). But it isn’t something I would have expected. –Ok, you probably knew this but a brand called stingers (I think) makes all kinds of nutritious foods which are extremely tasty and I’m thrilled that I am actually working our hard enough where I can justify the calories they contain:) There is this really cool instant energy honey waffle thing that I call lembas because that is seriously what it looks like:) There are also instant energy fiber gummies which are incredibly delicious. –I’m also learning a lot of little important things like the importance padded shorts (really weird wearing those tight little things for the first time! but extremely helpful after an extended period of time) and the importance of really light shirts. I am also learning a little biking etiquette. Some one told me that MN is one of the biggest biking states in the US which surprised me. If you are in Minnesota, there are two great cities that you should see. Ok, really, the Twin Cities are packed full of fun great things to do and see and eat but I mean there are two of my favorite cities to take little road trip vacations to:) Some friends pile in a car and we leave for the day, leaving troubles behind and just having a great time. I love these because they are the perfect little mini vacations. 2. Glensheen Mansion–We did go to this place! Ok, get this: the sitting room has a golden ceiling. It is covered in gold that is scrapped so thinly over it that if you were to pile it all into one place it would be about the size of a golf ball but they spread it out and made it a covering for the ceiling! Talk about crazy! It’s a rather historic place and is now owned by a university but would apparently take 32 million to build today. 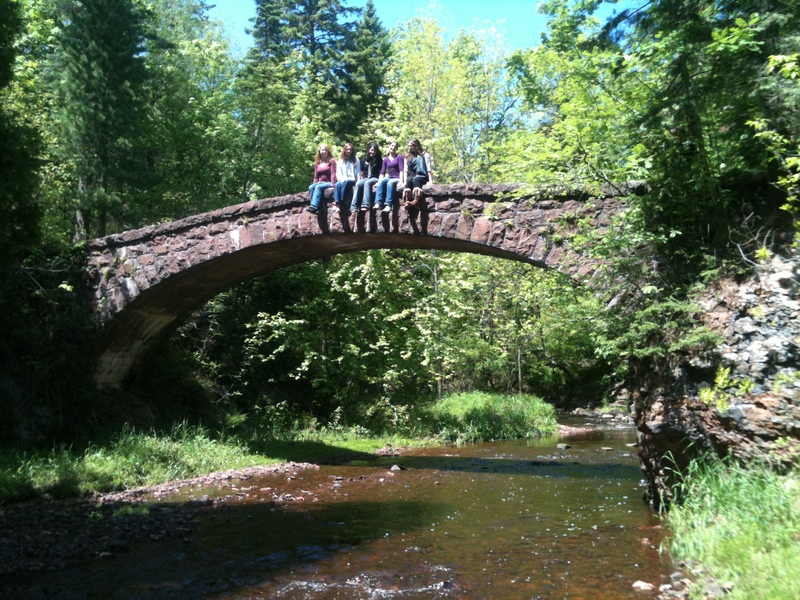 And it has beautiful gardens and is right up against lake superior:) We found this gorgeous stone bridge on the property and took a picture. 4. Grandma’s Restaurant–I don’t know why but people say here is the best place. And it was pretty awesome. And you can eat on the roof and watch the big bridge lift up. 5. Tobies. Ok, this isn’t in Duluth but it is in-between the Boundary Waters (sp?) and the cities so people always stop here as a half way point. I was surprised how tiny it was. EVERYONE but me knew about it and it’s this tiny little place that you could think was just part of a gas station but they have cinnamon rolls which will make the drive that much better! 2. 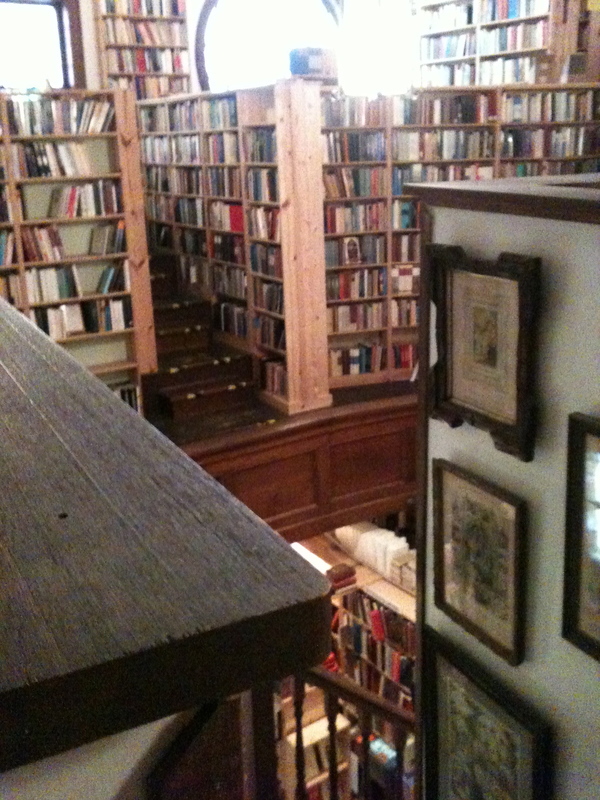 Loomes–If you are a book lover, this place is epic. 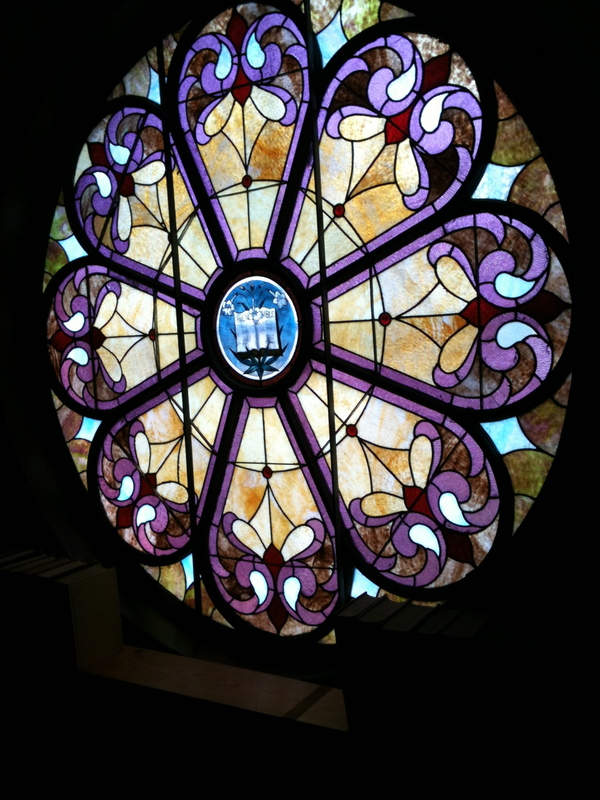 Its a Catholic book store that is built inside an old church and the only book store that I know of that has stained glass windows! 3. The cruise–there is a cruise place that you can go to which is awesome! We didn’t go this time (poor starving college students that we are) but I did go on it for my high school senior cruse. There was a live little jazz band and we swung danced on the roof of the boat as it glided along between the gorgeous tree covered hills of the wisconsin and minnesota. 5. The trolley ride–I went when I was really little and it was great. It’s just fun getting a great tour of the city and going up and down those crazy hills. Ok, funny fact about cities with hills. I cannot stand driving on hills but all of my favorite places are super hilly. San Fran is the hilliest and it is my favorite. But I refuse to drive up steep drive ways. Go figure!